KP and Punjab secure first position in the comparative score card on overall quality of governance at 68%, Sindh ranks second at 59%, followed by Balochistan at 58%. According to PILDAT’s Governance Assessment in the first year (2013-2014), Punjab was ranked first at 42% followed by KP at 37%, while Balochistan and Sindh had tied for third place at 34% each. PILDAT’s Score Cards are based on the change (improvement, deterioration or no-change) in the quality of governance between the first (2013-2014) and the second (2014-2015) years of the Governments in office after May 2013 General Elections. The Assessment is based on 25 Governance Assessment Parameters (GAPs), under 5 Pillars of Governance: Rule of Law, Management of Economy, Social Indicators, Service Delivery and Administrative Effectiveness. 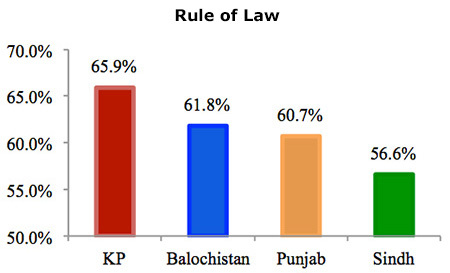 KP stands 1st in Rule of Law, Management of Economy and Service Delivery; while Punjab leads in Administrative Effectiveness and Social Indicators. The Government of Balochistan’s performance improved in 20 parameters, deteriorated in 4, and remained stagnant in 1 parameter. The Government of Sindh’s performance improved in 20 parameters, deteriorated in 4 and remained stagnant in 1 parameter. 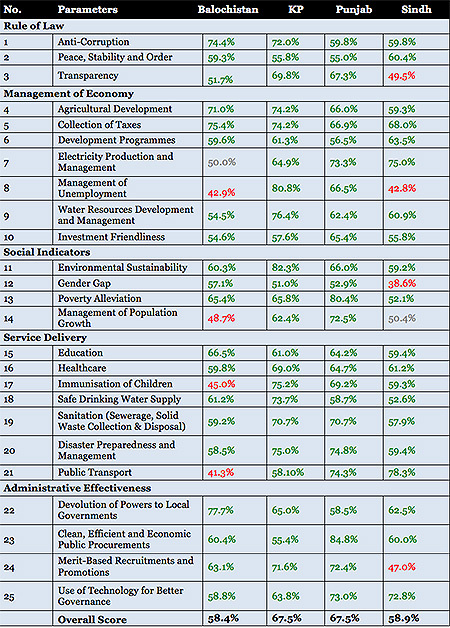 March 31: PILDAT analysis reveals that Quality of Governance in Pakistan’s Provinces is improving slowly and gradually. 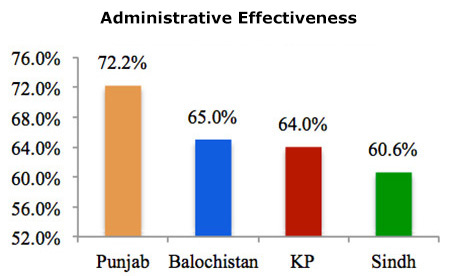 The Provincial Government of Khyber Pakhtunkhwa (KP) closed the gap with the Government of Punjab as both received an overall score of 68% in their performance on quality of governance in the second year of the Governments, since assuming office in 2013. There is more to the good news- Government of Punjab and Khyber Pakhtunkhwa received a positive score (above 50%) for all 25 parameters assessed. Whereas, the Government of Sindh and Balochistan performed positively across 20 parameters, while performance deteriorated in 4 and remained stagnant in 1. KP leads in Environmental Sustainability at 82.3% while Punjab is the leader under the parameter on Poverty Alleviation at 80.4%. The performance of both the KP and Punjab Governments has been lowest in the parameter on Gender Gap at 51% and 52.9% respectively. According to PILDAT’s assessment, the Sindh Government comes in third with an overall score of 59% and Balochistan fourth at 58%. The performance of the Balochistan Government has been highest for Devolution of Powers to Local Governments (77.7%), being the first Province to complete its Local Government elections. It was also the first Province to have operational Local Governments. Balochistan’s performance is lowest in Public Transport at 41.3% for which Sindh outperforms the remaining Provinces at 78.3%. However, according to PILDAT’s assessment, the Sindh Government has been weakest in bridging the Gender Gap in the Province. 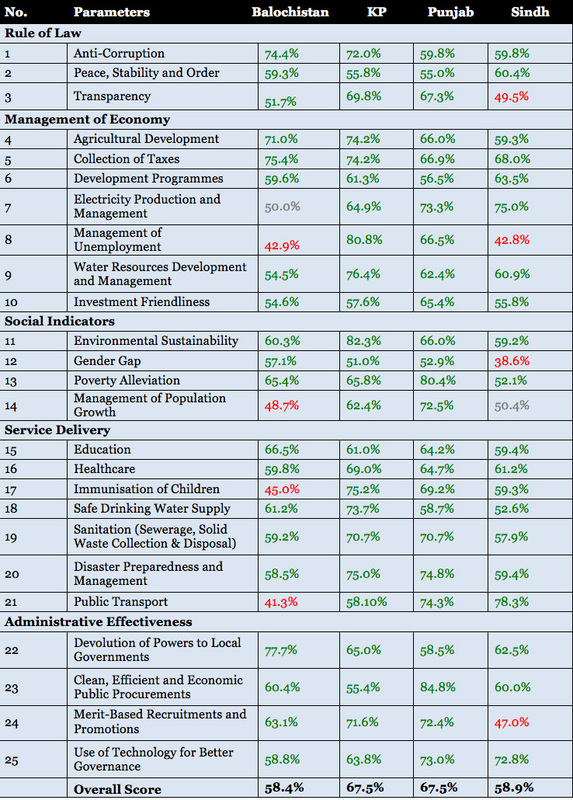 The comparative analysis on quality of governance across Pakistan’s Provinces is carried out by PILDAT since 2013 to highlight key areas of strengths and potential areas requiring improvement in the quality of governance. Government of the Punjab garnered the highest score of 84.8% for Clean Efficient and Economic Public Procurements, across all Provinces, among all 25 Governance Assessment Parameters. Whereas, the Government of Sindh received the lowest score of 38.5% for Gender Gap among all parameters under consideration. The objective behind PILDAT’s initiative on Assessment of the Quality of Governance is that as democracy progresses in Pakistan, public focus should now be on the performance of democracy, distinct from the process of democracy. With this Score Card, PILDAT seeks to understand the extent to which the democratic Governments have delivered to their citizens in terms of providing ‘Good Governance’. The initiative is by no means an exercise to criticize the performance of the Government, but in fact a collaborative effort intended to enable us in making informed, fact-based assessment regarding Provinces. For the purpose of second year assessments, PILDAT has slightly modified its framework and scoring mechanism. 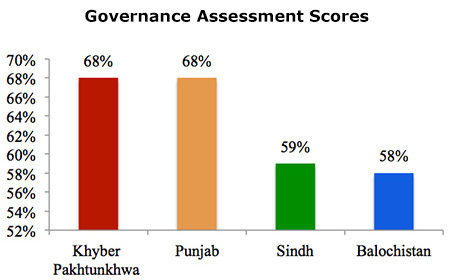 Scores are assigned on a scale of 1-5; based on the comparative performance of all Provincial Governments. 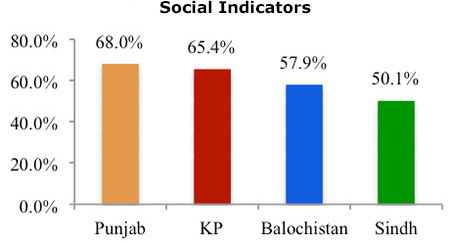 A Government gets a score above 3 for a particular indicator if percentage change from 2013-2014 to 2014-2015 is more than the average percentage change across all Provinces. A lower score is assigned for the inverse. The scores, based on both policy (25% weightage) and its implementation (75% weightage), are aggregated to arrive at overall score for the Provincial Government, across 25 areas of governance. 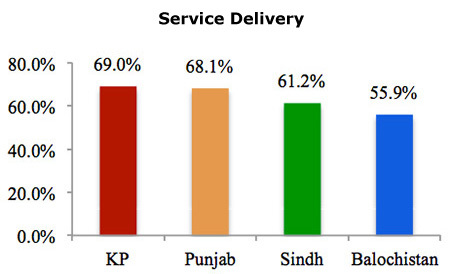 The data for the Provincial Score Cards was requested by PILDAT and was provided by the Provincial Governments. It was supplemented with published surveys (i.e. 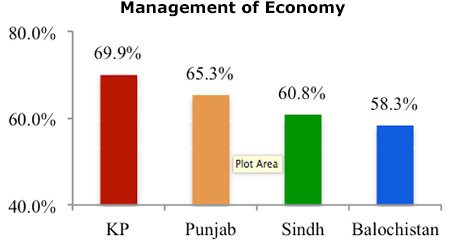 Labor Force Survey, Pakistan Economic Survey, PSLM etc.). Several meetings were held with Government Departments during the process of this assessment. A draft of the analysis and Score Card was shared with the Governments for feedback.